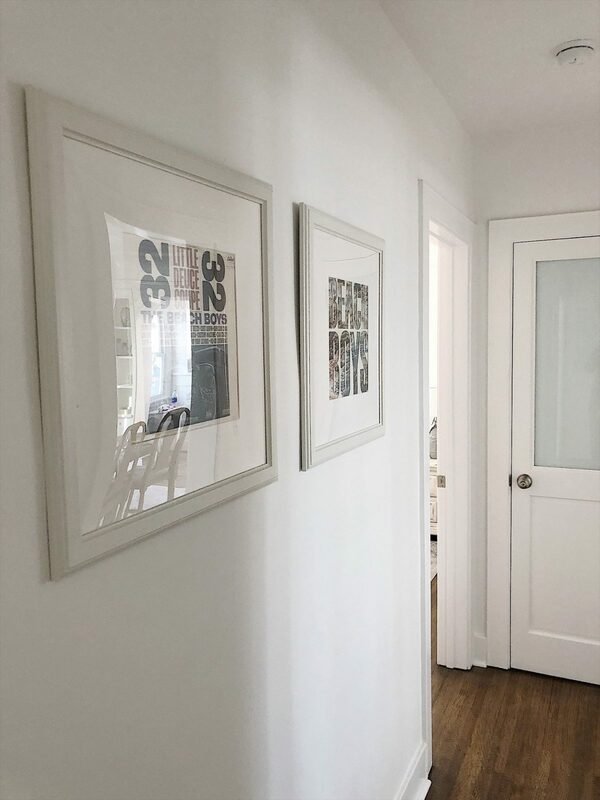 Many of you know I was very lucky to help some friends with their remodel of a 1928 beach cottage located in Long Beach, California. 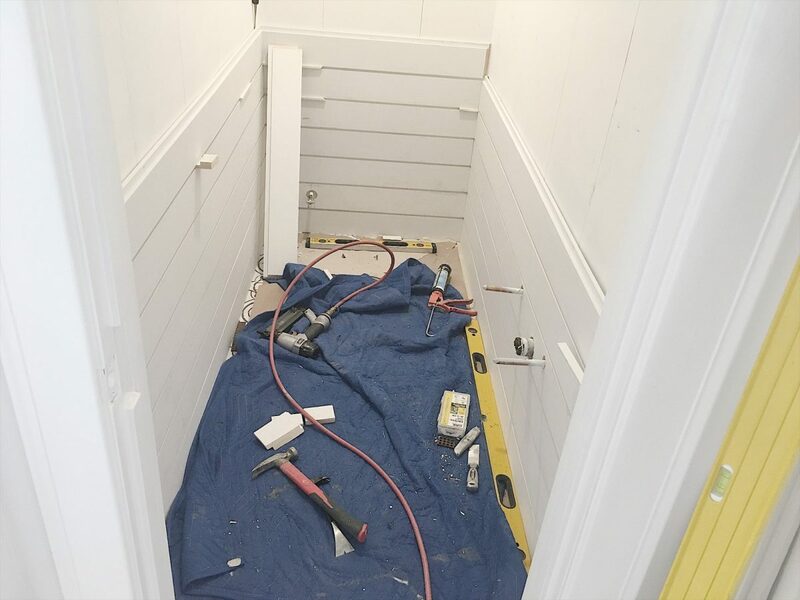 The entire cottage was redone (and gutted in many areas) and I am so excited to start sharing the before and after photos. 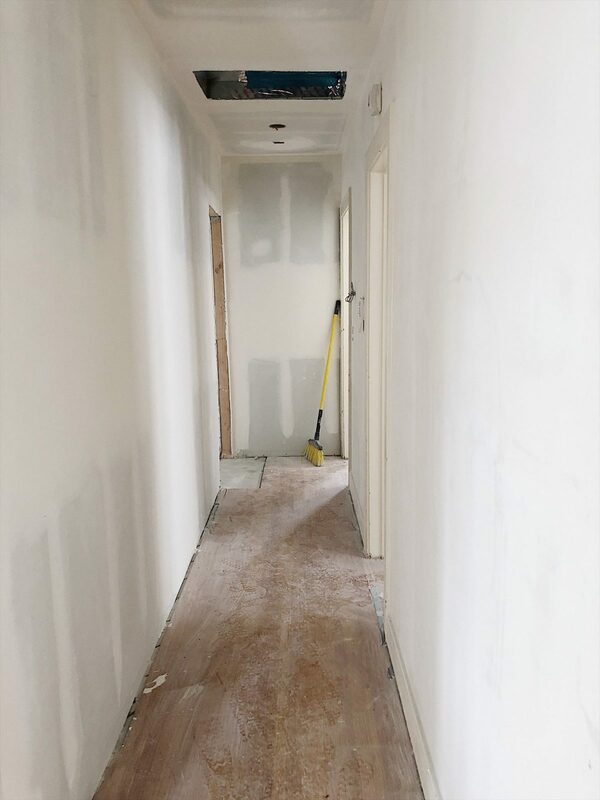 Today I am sharing the powder bathroom and the main hallway remodel. I previous posts I already shared how I selected a daybed, a DIY of how I painted a wooden armoire with milk paint and a trip to the flea market where I found some furnishings for the beach cottage. 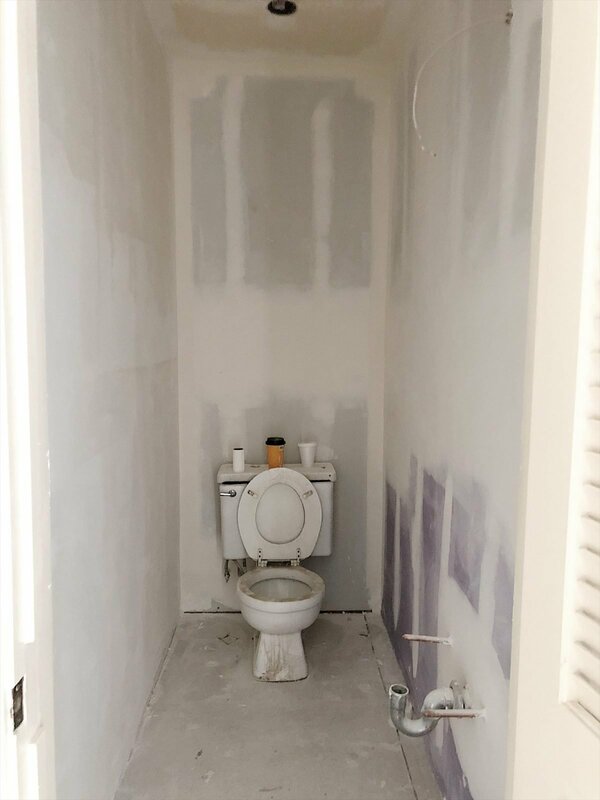 So let’s start off with the before photos of the powder room. As you can see, the bathroom was pretty basic. And ugly. 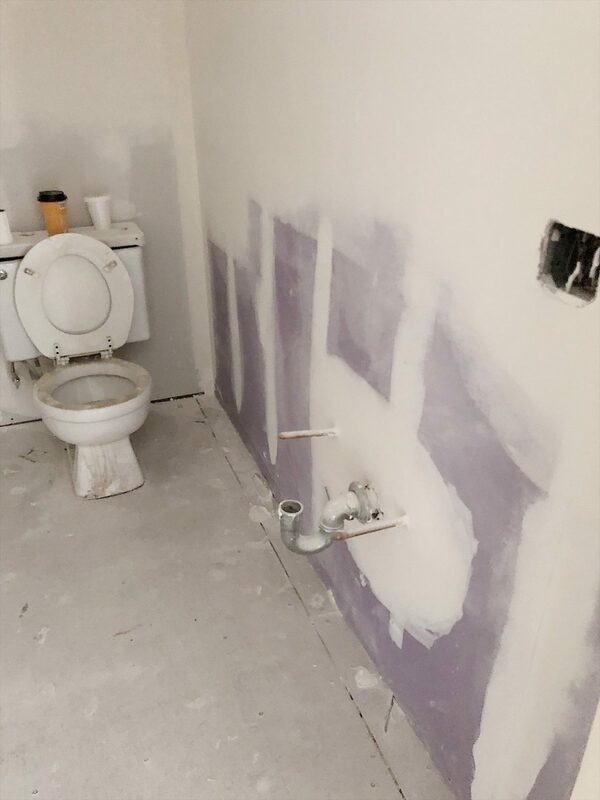 The plan was to replace the sink and toilet and add lots of character! 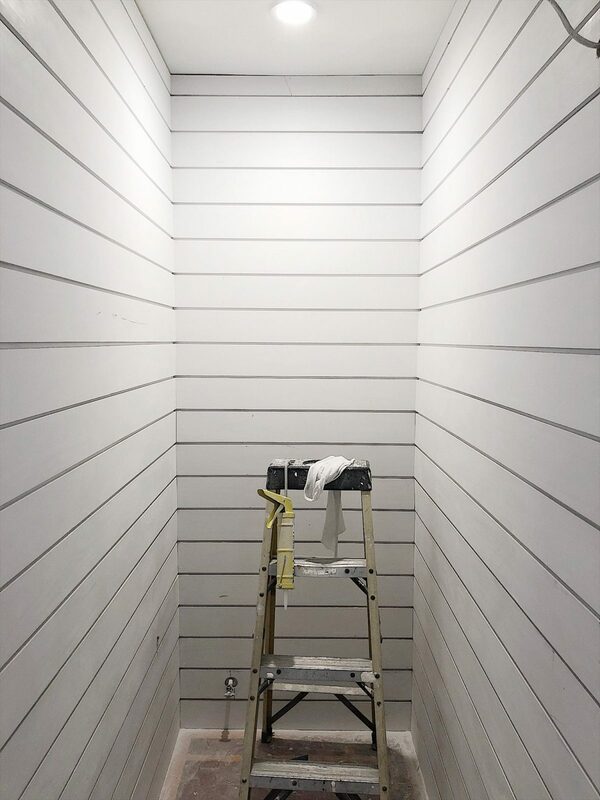 Believe it or not, this was my first project of installing shiplap. 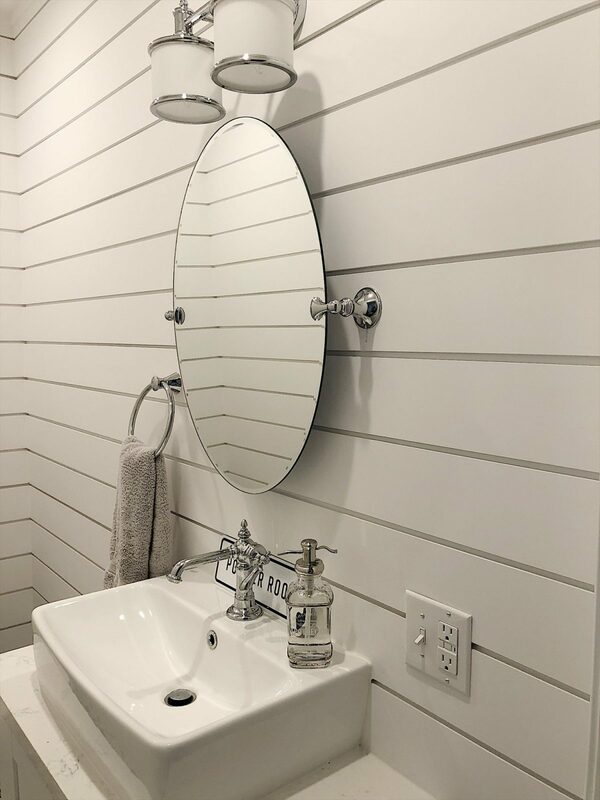 (Can you believe there isn’t any shiplap in our home? At least, not yet.) As you can see, they used the traditional ridged shiplap. And I love it. The impact is spectacular. It is just amazing. The sink and cabinet needed to be really narrow so we had the cabinet built. The mirror and hardware perfectly finish it off. 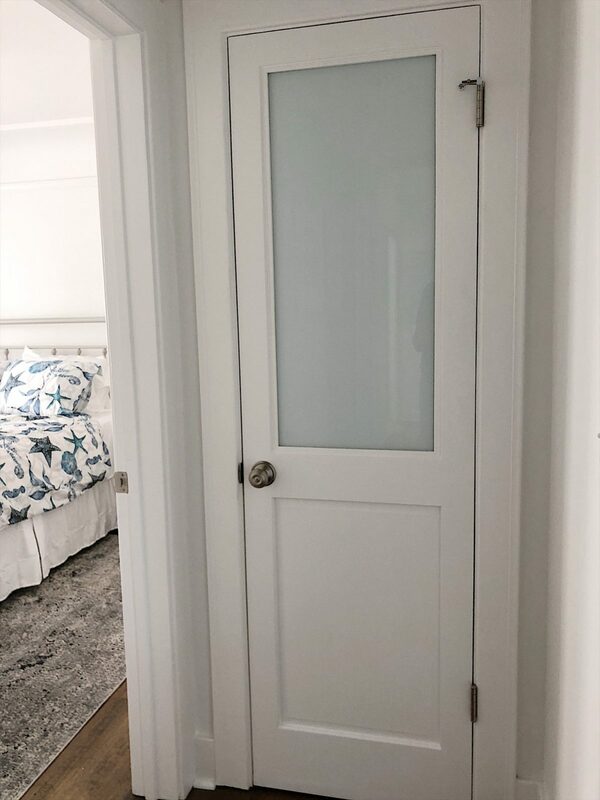 The door to the powder room is original but I asked the contrator to cut out one of the panels so we could add glass and let more light in. We went back and forth on what kind of etched or ribbed glass to use and I love the end result! Wow. I know what you are thinking. The hallway? Who worries about decorating a hallway? The answer would be me! I don’t have a photo of “the before” but this hallway kind of didn’t exist so you will have to use your imagination. Here is what it looked like pretty early on in the renovation. 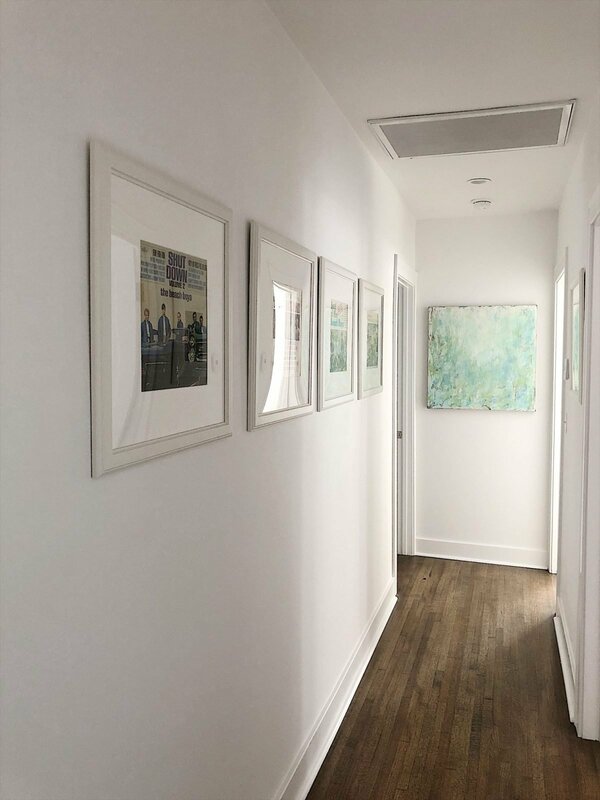 Some nice molding, recessed lighting, and art did the trick. 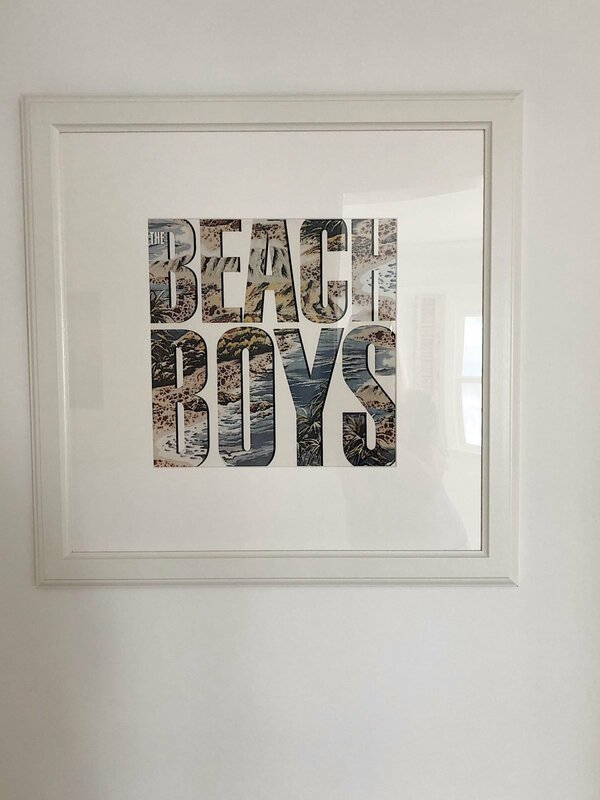 I hung seven framed vintage Beach Boys album covers in the hallway. I found the albums at the flea market and I paid between $3 and $12 for each one. The frames are from IKEA and I love how the album covers fit in the frames so perfectly. By the way, take the albums out before you frame the covers! And yes, I did pick the albums that matched our color scheme. This is my favorite album of the seven I found. I did all of my shopping at the Rose Bowl And Long Beach Flea Markets. 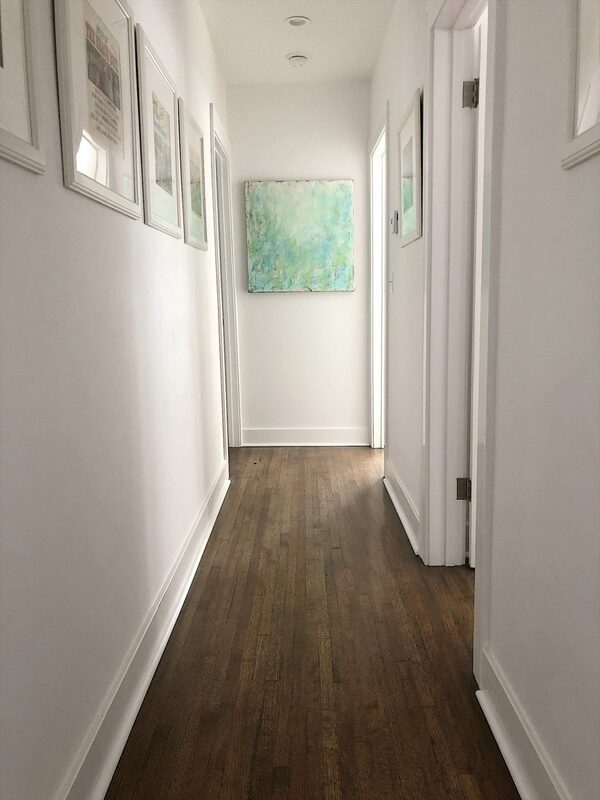 At the end of the hall, we placed one of my paintings. This one was hard to let go, as it is one of my favorites. But I know I have visitation rights at any time! 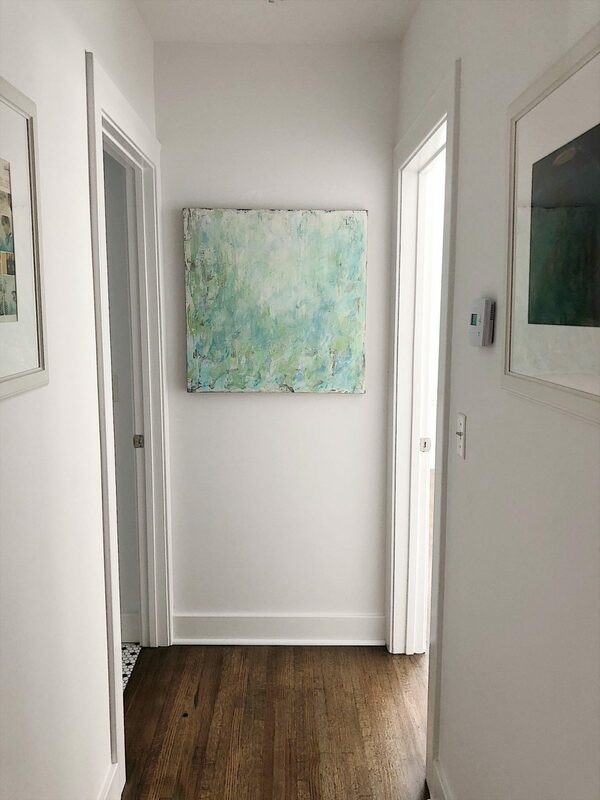 It is amazing how some creative and fine art can change the look and feel of a hallway. You might want to try it your own home. 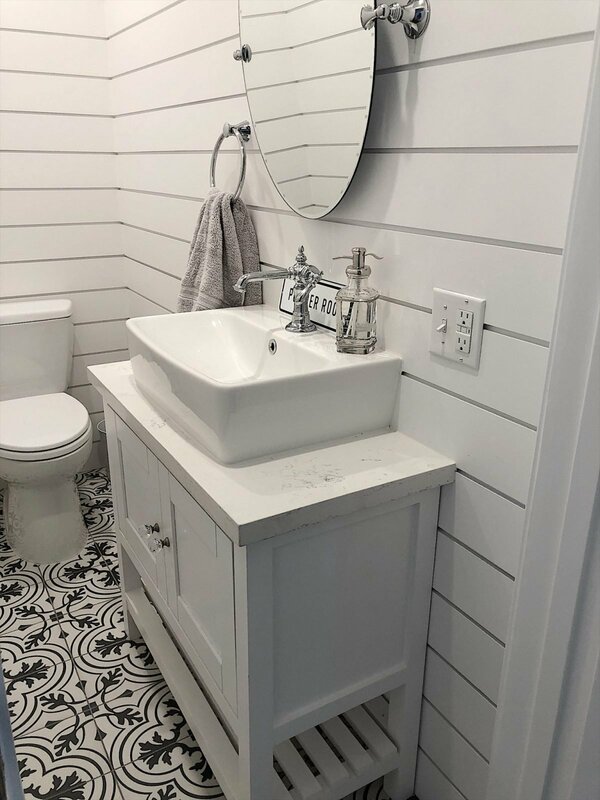 I can’t wait to share more of this newly remodeled Beach Cottage. I also will have the Airbnb information for you too! You did a fantastic job! Right away I noticed that Beach Boy’s album and it was the first thing I was going to ask…”where did you get it”? I loved it and would never think of looking for things like that! Then when you showed all the album covers, I thought it was just a great idea. Thanks for showing us! Beautiful Leslie! 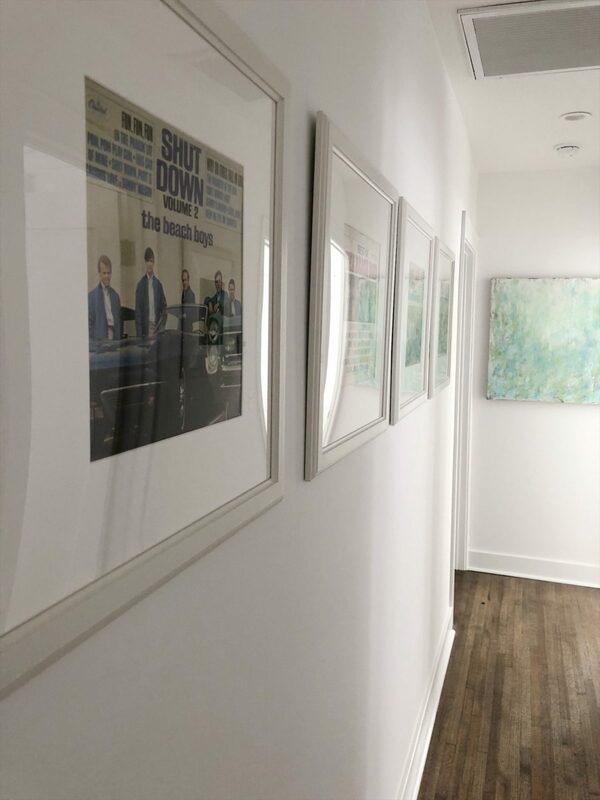 Love seeing your art in this home. The bathroom tile is perfect. Looking forward to seeing more. what is the measurements of your little bath? we need to add a guest bath in a hall somewhere. is it about 5 ft by 10 ft. thanks leslie!!!! its beautiful, functional!! Wow great job! 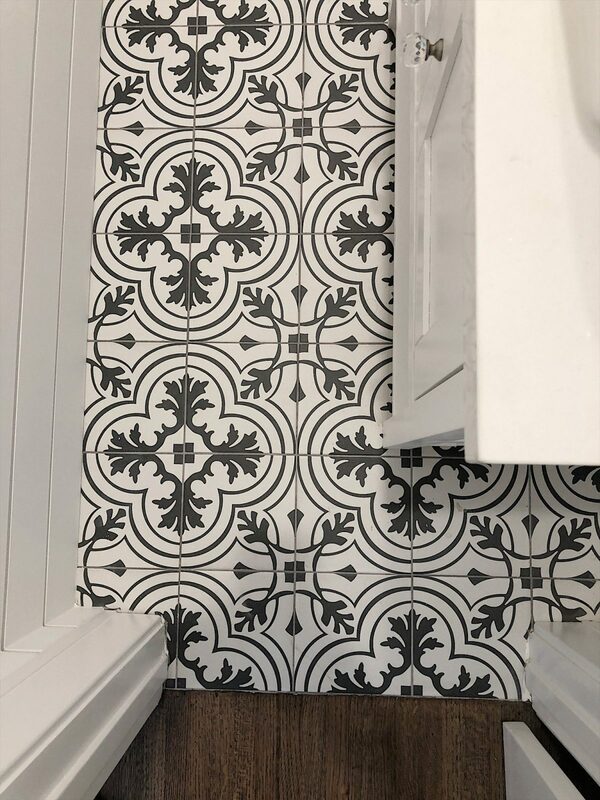 I have to find a place for that tile, I believe it will go in my mud room! Can not wait to see all of the rooms! Love everything you did. 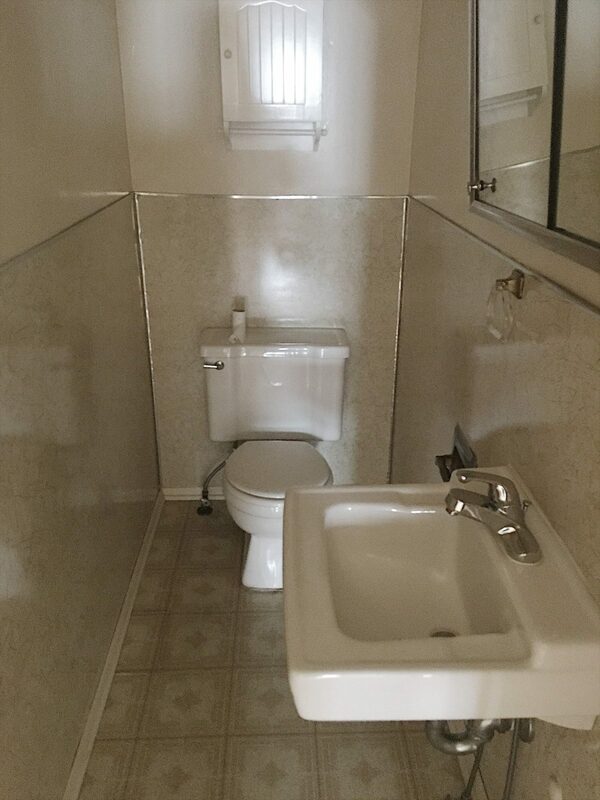 Could you please tell me where the sink and fixtures came from? I didn’t see them listed in your blog???????? I love your vision and that painting!…WOW!! !…everything looks amazing, can’t wait to see the rest! 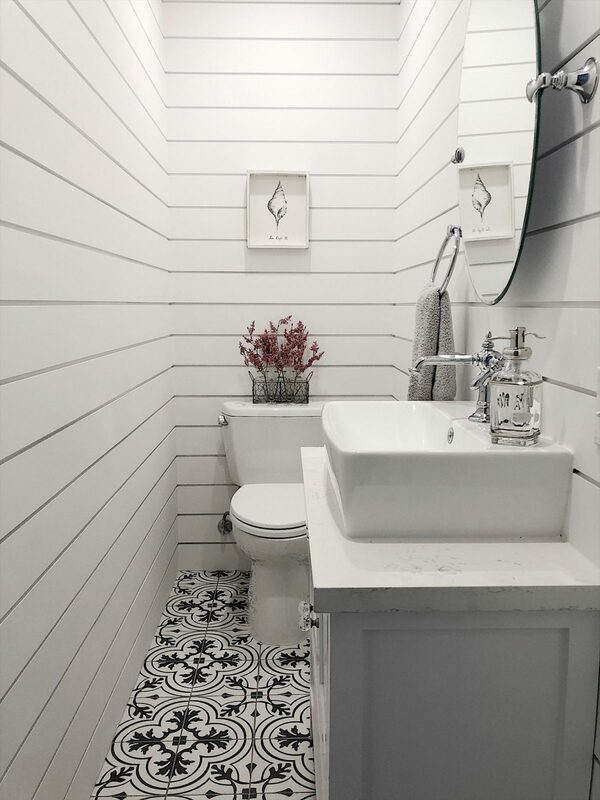 Leslie, that little bath is just gorgeous, especially love the tile! Love your painting too! Can’t wait to see more! You would never believe these are the same rooms. Great remodeling.???? I’ve two grandchildren living in the area and was wonder who to contact about renting this lovely home. Do you know when it might be available? Hi! 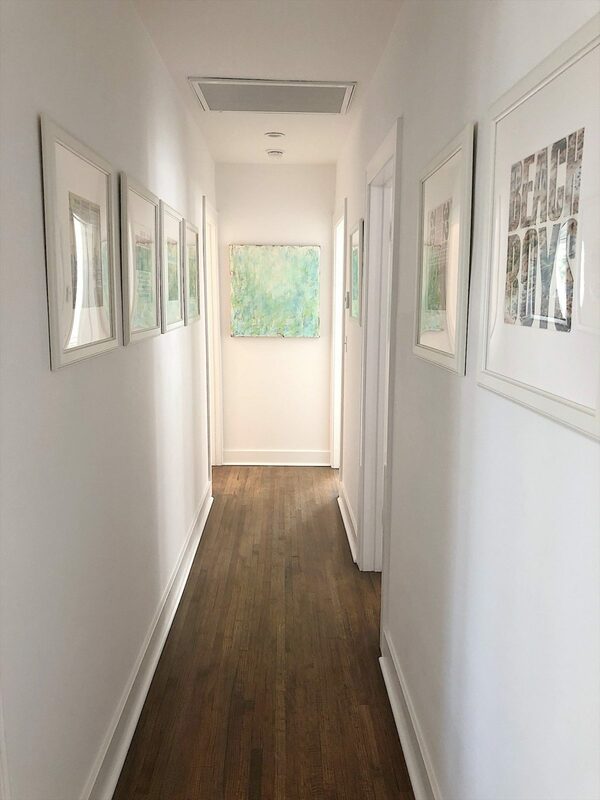 I love the hallway paint color! Can you please let me know the color of the wall and molding please? Thank you!!! !